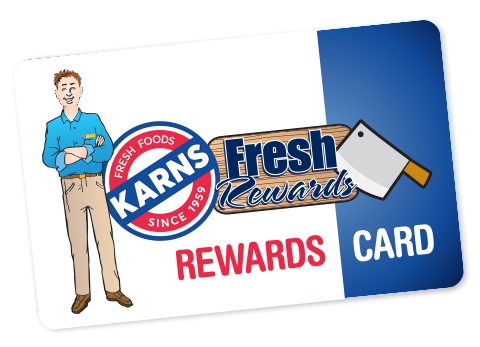 Karns Fresh Rewards | Now Better Than Ever! First time logging in to our new upgraded system? Please click on "Forgot Password?” below to update your password for account access. Email or 12-Digit Card Number Starting With 4: Where Can I Find My Card Number? If you have forgotten your password, please enter your email address or 12-Digit Card Number starting with 4 and we will email the associated email address instructions to reset your password. Please add email@karns.net to your safe senders list to help ensure you receive the email with password reset instructions (How To Whitelist Email). If you cannot remember your email address or card number, please visit your local Karns for assistance. Where Can I Find My Card Number? Earn Points with Every Karns Purchase! 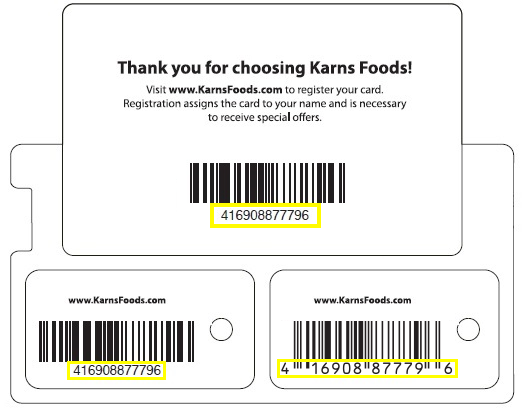 Redeem For Max Dollars From Karns! How much will you save! At Karns we work extra hard to save you money. That's why we're offering this exciting new upgrade to our popular Fresh Rewards Program. Most grocery stores offer rewards programs with confusing rules. At Karns we aim to keep things simple. For every dollar you spend you earn one point*. Cash them in for Max Dollars from Karns. *Point calculations are exclusive of coupons, discounts or Max Dollars, and are added based solely on actual monies spent. You would need a 34-gallon gas tank to match Karns Savings! Now more than ever, it pays to shop at Karns. In addition to our weekly Top 10 Deals and great specials on everyday items, Karns Fresh Rewards guarantees that the more you spend, the more you save. At Karns you earn one point for every dollar you spend.† Your points total is listed in your weekly Karns email. †Points expire 18 months from the end of the month they were earned. If you make a purchase without using your Fresh Rewards Card you can still receive points if you turn in your receipt to Customer Service within 30 days of your purchase. Transaction must reach at least $1.00 total after discounts, coupons & Max Dollars to be eligible to earn rewards points. 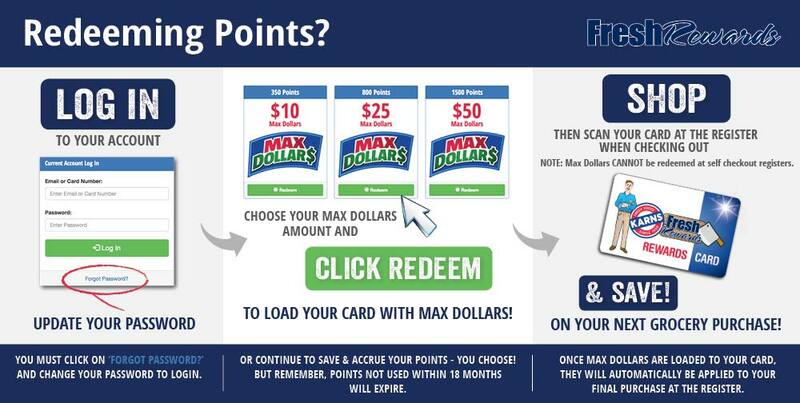 The only thing better and easier than earning Karns Fresh Rewards points is redeeming them for real savings. Forget the gas discounts at the other stores! With Karns Fresh Rewards, you could save twice as much or more. You'll save more at Karns by using your Rewards points to receive $10, $25 or even $50 Max Dollars from us!